Hello my lovelies! I have a review of one of my favorite brands' newest releases. I've reviewed the smaller round Hehe plates before (here) and I think they have fantastic designs. 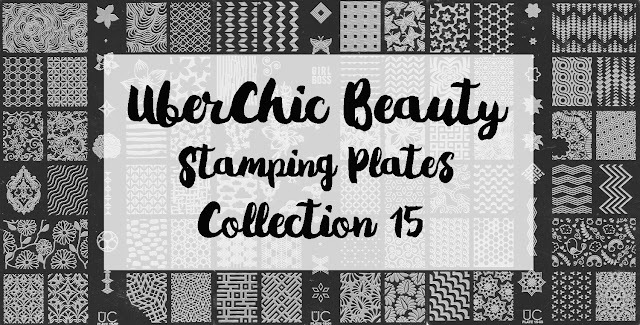 I was sent their three new Plus plates which are obviously larger and have more designs. I also received the Science Collection that was released last year, so keep your eyes out for that review coming soon! Hello ladies! I have a few swatches from a recent purchase of a brand quickly growing in popularity- Vapid Lacquer. It's no surprise really, they produce some gorgeous polishes! The one downside to their rise in the indie polish world is that they sell out so fast, you need to be on top of your online shopping game. Fortunately for me I'm at home all day and my schedule is wide open to buy all the things! Hello lovelies! 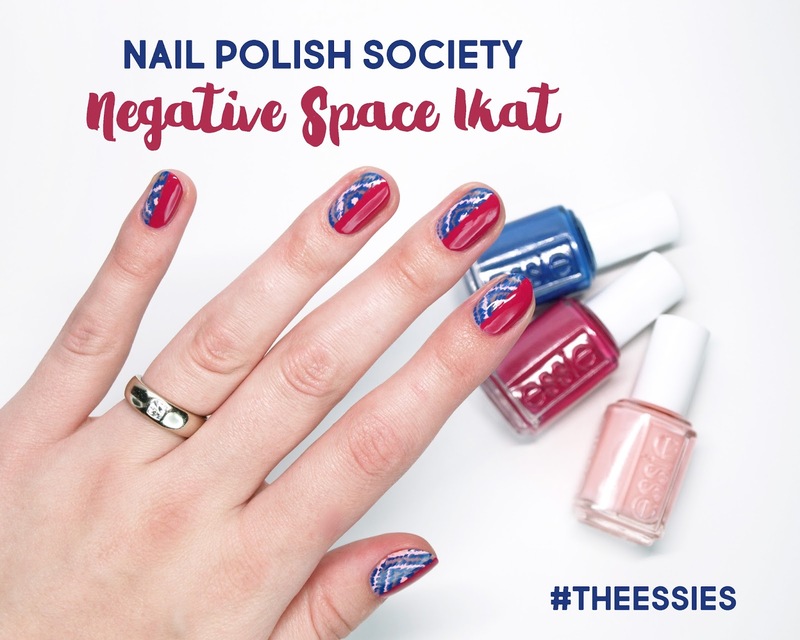 I am so thrilled to share with you that I am one of the top ten finalist in The Essie 2017 nail art contest! Isn't that amazing?! I still can't believe it. My first entry was this Drag Marble Swirls video tutorial. For the next round of competition I was asked to create another nail art look using the Essie Spring 2017 Collection. I came up with this bold, negative space ikat design. Pretty eye catching, don't you think? I'm always a little afraid of trying negative space designs, but I think it works so perfectly here. I have another UberChic Beauty stamping plate post for you today! I never get tired of these because I always come up with one or two looks that I really love. This time though I really think I love every one! Let's see if you do too.. It's rare that I post swatches of a polish on its own, but this one is special enough that it deserves the spotlight. I have seen toooons of photos of Sinful Colors Prosecco but was never able to find it in the stores/ I didn't look too hard for it. You can only chase after so many polishes at a time, right? Well I laid my hands on this recently and finally understand the obsession. Oh my goodness, are you ready for this? For all you doubters who thought I was all hands and no face, I'm going to prove you wrong for once and for all. Okay, so that was never a thing, but here I am anyway! I mentioned on my Instagram a few weeks back that my love for makeup, which has laid dormant since I started spending all my monies on nail polish, is resurfacing. I broke down and signed up for a subscription box which I had wanted to do for so long. This is my first Ipsy Glam Bag and I wanted to share with you all! Hello loves! I have some of my favorite body products to share with you today. When Sunny asked if I would review this Spring sampler box I was ecstatic. I have been using these products (and blogged about them here) since my favorite nail blogger Very Emily (who sadly is no longer blogging *sob*) made me aware of them. I always looked forward to her beautiful review posts and tried to make mine in the best "Emily fashion" I could. My seven year old son also did his best in helping me take these photos, so a big thanks goes out to him! Happy St. Patrick's Day ladies and gents! Since I don't own any green clothing (does teal count?) I wanted to do something festive on my nails for the holiday. So don't you dare pinch me! Hello my dears! Today I bring you new polishes from Colores de Carol! The Pure Imagination collection is a rainbow of nine linear holographic and iridescent glitter polishes, and one holographic flakie and iridescent glitter topper. I actually came up with the name of the collection and individual polishes! They were inspired by the elusive quality of rainbows and the boundless dreams and wonder they invoke. When Native War Paints recently released their Copper Penny Collection I knew I would need every. single. one. Absolutely no regrets, I love them all! 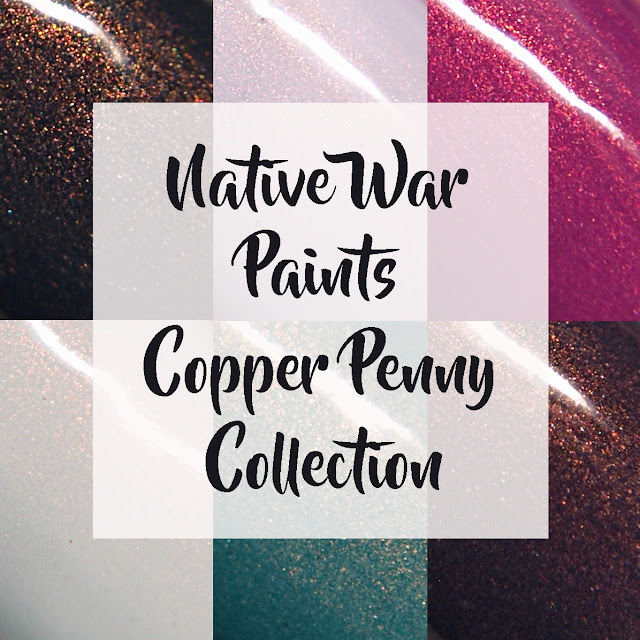 The collection consists of six different beautiful copper shimmer filled shades. If you love a good shimmer like I do, you are bound to love them too. Hello ladies! It is warm and sunny outside and I feel like singing! While the world is awakening, so is the need for color growing inside me. In the foliage, in my clothes, and on my nails. That is why I am so excited to share my review of the Dermelect 'ME' Spring/Summer '17 Romantic Renaissance Collection. The colors couldn't be more perfect for Spring. I have three of the six polishes from the collection, and the shades are giving me life! Green-tings lads and lasses! If you've been following my blog, you'll know that in the past I haven't been that big on green. But I think it's time to admit that I have been converted! 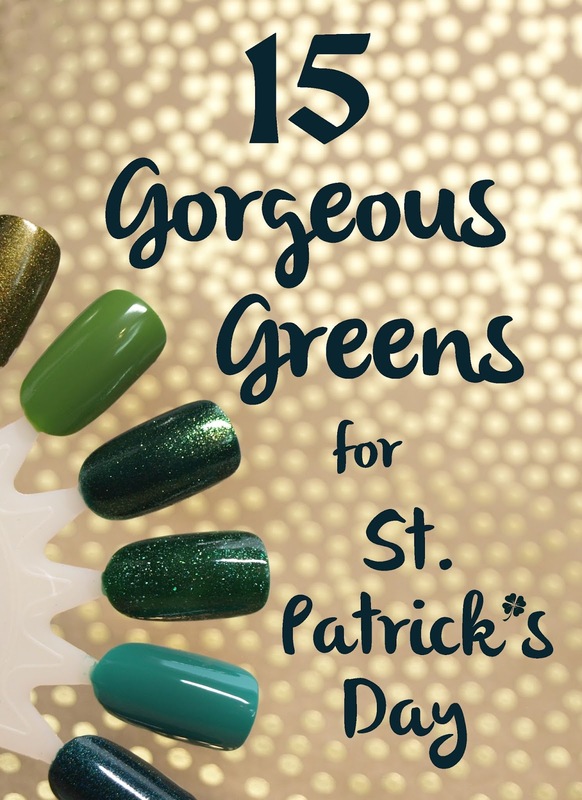 I have so many STUNNING greens that haven't seen enough love, and what better time to share them, than this month for St. Patrick's Day? I have compiled a list of 15 fabulous shades which are a mixture of mainstream and indie polishes. Some of these are just what you'd expect for the holiday, but I've included a few unexpected shades as well. Enjoy! Hello lovelies! Today I am sharing with you the two new stamping plates from UberChic Beauty, the Little Baby single plate and the St. Patrick's Day Uber Mini plate. 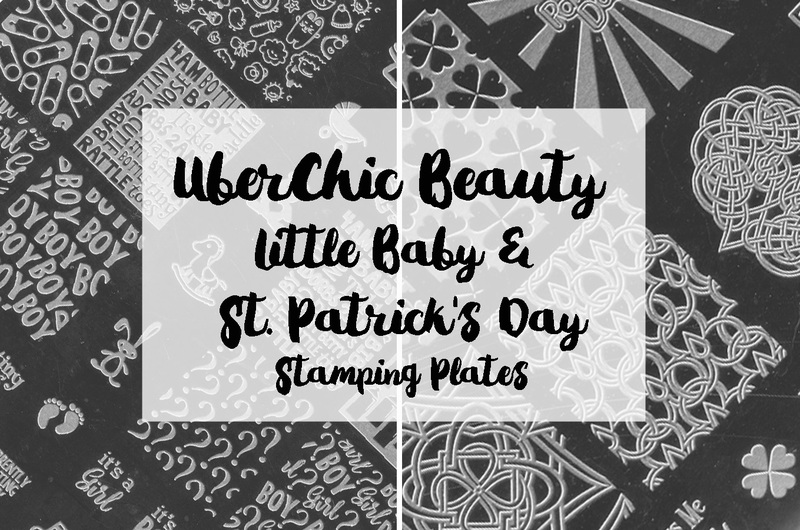 I'm not that big into St. Patrick's Day so I didn't see myself getting that enthused over the mini plate. I ended up loving the images and can't wait to use it again! Hello my lovely ladies! Last week I purchased this set of four cremes from the Glisten & Glow Oh, The Places You'll Go Collection. I just loved the inspiration behind the collection and the combination of colors. I mean c'mon, who doesn't love this book? The formulas weren't as fabulous as I had hoped for. You tend to get chalky formulas on colors like these, and that was my experience. I've got swatches for you today, but I'm going to test them out for nail art soon!